I was lucky enough to be invited to a book club this week at the Cosy Bean Coffee Shop in Garston, Liverpool and I had such a great time! 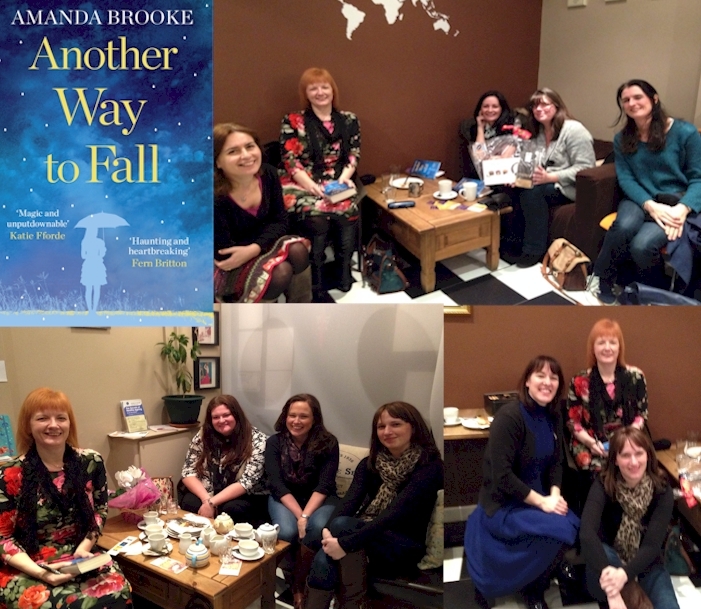 It was lovely chatting to everyone about Another Way to Fall and even though there were, as I suspected, lots of tough questions, it really got me thinking about my book and particularly my heroine Emma. I think everyone loved her as much as I do. The evening went by so fast and really had me thinking about what I’d written. It had been so difficult to willingly create a character who had cancer and then go on to dare to write as if I could know what it was really like – even with my own personal experiences. Thankfully I’ve had lots of positive, dare I say, amazing responses and reviews and I’m so glad that even though I may have made quite a few people cry, the overwhelming response to Another Way to Fall is that Emma’s story was inspirational rather than heartrending. One of the most interesting questions posed at the book club was about the Shopkeeper. Who was he?? I had to admit that when I wrote that particular character it was my deliberate intention not to explain who he was or what he might represent in Emma’s mind. Was he a religious or spiritual representation or did he embody something far more physical, another character in the book or perhaps the power at her fingertips? For me, he provided a way in which Emma could redress the balance in her life. She had suffered enough, sacrificed enough, she deserved to get to ‘the good bit,’ and what the Shopkeeper could offer was a life that was fair. But that’s just my view and I love that every reader will see him slightly differently – and the best answer by far on the night was that the Shopkeeper was really Emma’s laptop. Genius! I’d like to say a big thank you to Nicola Gill who runs the Cosy Bean and organised the event which raised an amazing £220 for Cancer Research UK. Thank you to all the book club members who made me so welcome and I hope to be invited back again one day soon! PS. I still haven’t worked out what the appropriate response is when someone says how much I made them cry… thank you just doesn’t seem quite right!? I live in Australia & picked up your book Another Way to Fall at my local library & I just had to contact you to say thank you for writing such a wonderful book! It was inspirational & heartbreaking all at the same time, every character became so real in my own imagination, I could picture all that you were writing as if I was watching a movie! By the end I was a blubbering mess, sobbing as I tried to read the last pages! Im going to miss Emma’s journey & diary! Thank you again for giving me that excuse to pick up your book every opportunity I had during my day! Thank you! You have no idea how much I love hearing from readers and I have yo agree, I miss Emma too. Maybe one day I’ll continue that story, I’d love to know how she continued to inspire her family and friends. I’m working on the rewrite of my 4th book at the moment and it made me cry yesterday so if you stick with me I’m bound to make you blub again!